STRATHMORE – There are moments in life which seem to last forever and then there are those that fly by. The latter was true for the Strathmore Class of 2018. 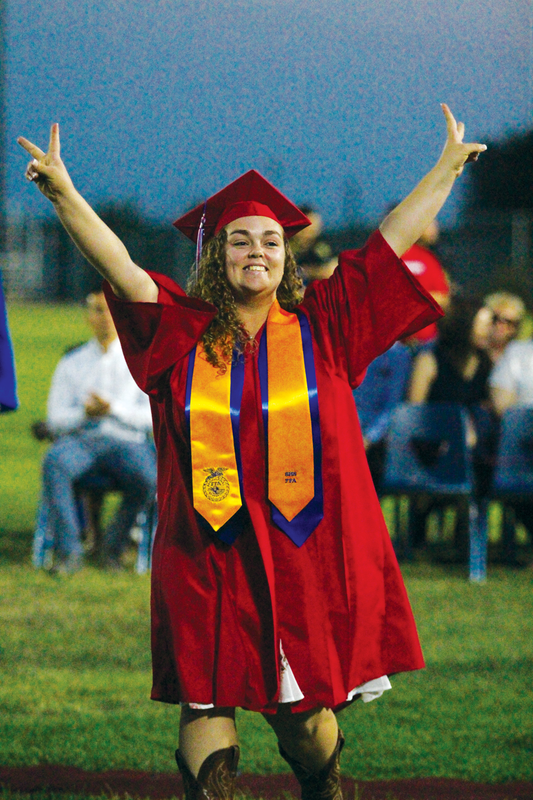 The 63 students felt as if they had just begun their journey when it was time to receive their diplomas in front of friends and family last Wednesday night at Spartan Stadium. Even one teacher, Debra Clevenger, graduated into retirement and decided to walk with her last students. To say Clevenger was close with the class is an understatement. She was co-advisor for the class and taught each one as they took her government and economy class. The teaching part was something she had done each of her 26 years at Strathmore. However, with this being her last she decided to take a step back and focus on enjoying her time. Even though her high school years as a student had still gone by quick she was still in awe of how fast her career had gone by. “Twenty-six years teaching, that is quite an ordeal,” Clevenger said. For the students it was relationships formed with teachers and faculty which made their time at Strathmore so enjoyable. Class Valedictorian Teresa Alcantar mentioned during her speech the connection between mentor and student allowed them to accomplish a great many things. One of them being winning championships on the various playing fields. Gino Guillermo points to his family in the crowd as he walks during Strathmore High School’s graduation ceremony. Photo by Patrick Dillon. Despite the size of Strathmore, it offered its students a variety of learning opportunities both inside and outside the classroom. Alcantar even compared the wide range of choices to a larger school. Over the years the class made many improvements. They began the ground work on their new agriculture farm. A fixture at the school which will lend its usefulness to the Ag Pathway students at Strathmore for years to come. This class had 30 students compete the pathway. Inside the classroom they have raised their grades across the board. Alcantar began to reflect on just how quickly the years had gone by. She compared it to a blink of an eye. “It is hard to believe that we have spent four years at Strathmore, because if feels like we just started our freshman year,” Alcantar said. Earlier in the ceremony Eric Morales touched on the accomplishments and the future during his welcome speech. Mentioning that each of his classmates had accomplished what they needed to do to receive their diplomas. However, he encouraged them to not stop there. “It is important to remember that high school is just the beginning,” Morales said.